Summary: Rav Yonatan Eibeshutz did NOT describe the Tower of Bavel as a rocket ship, though this is the common presentation of his idea. In a previous post, "Rav Yonasan Eibeshitz's Rocket Ship", I provided the actual text in Hebrew, together with my translation into English. In this post, I'd like to provide a bit of analysis. Post: First, read carefully through my previous post about Rav Yonasan Eibeshitz's theory of the design and purpose of migdal Bavel. Only then, read this post. The tower was itself a rocket ship. This means that it was to be propelled by rocket fuel and sent into outer space. Its purpose was to (physically) attack God. At the time of Rav Yonasan Eibeshitz, there was nothing akin to this idea, or its implementation details. That he got all these details correct demonstrates the awesome power of Daas Torah. And similarly, Chazal must have known all of modern science, and then some. How religiously inspiring! The tower was the launching pad for a vessel. The idea is that there is thick air closer to the ground and thinner, purer air higher up. Once above the thick, murky air, that thick air would prevent the vessel from descending to the earth, and the winds would continue to carry the vessel up and up. By launching pad, don't think of the type that is on the ground, and there is a countdown before blast-off. No. It was more like a space elevator. They needed to get to a specific elevation, and then just cast the vessel into the air. This vessel (which was entirely apart from the migdal Bavel) was not propelled by gunpowder, or rocket fuel. People who suggest this have misread Rav Eibeshitz's words. He does talk of polvir, which one burns and it propels a ball through a tube, but this was speaking about what contemporary engineers, in his own time, had done. He uses this for evidence about breaking through the lower, murky air. But he is NOT saying that the people in the Dor Haflaga (Hapalaga) used any gunpowder or rocket fuel to move the vessel launched from the tower. Rather, they just intended to carry the ship up the tower, and let the winds there lift it up towards the moon. He never mentions the idea of this vessel being used to launch an attack on Hashem. Perhaps he obliquely refers to it when he mentions the midrash with different groups with different purposes, but it is not even clear that he adopts the specific suggestions of the midrash, or takes them literally. Rather, the purpose of the vessel is simple relocation to a moon colony, where the rain cannot get them. There was in fact plenty of ideas akin to his idea, and he plainly states as much. He refers to contemporary engineers who performed experiments to show how explosive powder can cause a projectile to rise to an altitude to which it does not descend. And he writes "And they have already written articles on how to make such a ship as this to travel to the Moon. But the main point is that this ship must first rise above this murky air." The articles, or writings, might have been science fiction of the time. See what Shmerl wrote in the comments on the previous post. Furthermore, he did NOT get the details scientifically correct. For example, a straightforward reading of his words make it appear that he does not know about the vacuum of space, but rather believes that there are mighty winds all the way to the moon. And I don't think wind coming from the earth is current accepted science. And he does not refer to gravity, but rather believes that the thick and murky air which is lower down weighs down flying machines and compel them to descend to the ground, but that the fineness and purity of the air above would not weigh it down, and indeed the murky air would impede any projectile from returning to earth, instead keeping it up. Compare with what we know about degrading orbits. And he believes there are no clouds higher than 5 mil, while I think scientists nowadays place certain clouds much higher. Therefore, to use this as a proof to Daas Torah, and that he knew all of science, seems to me a bit ... misguided. Apparently, Rabbi Avner Levy was not paying much attention to what was going on in his sefer, either, because he was reading on and on in complete fascination things which Rav Yonasan Eibeshitz never wrote. Rabbi Levi reads that "the Tower of Babel was in fact a rocket ship". But it was not. 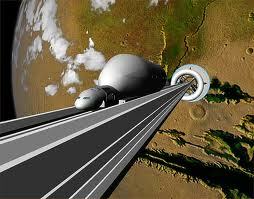 It was a launching pad for a rocket ship, or rather, a space elevator. And the "ship" was not to use any rockets. Rabbi Levi reads the sefer to say that "that was how they'd had any thought of fighting with God above". But Rav Yonasan Eibeshitz is not focused on the fight with God above, but rather the settlement of a colony on the moon, in order to escape any future Mabul. My guess is that while the author of this novel has Rabbi Avner Levy read the sefer, he himself did not read the sefer, but is relying on the popular account of Rav Yonasan Eibeshitz's theory. What a great kiruv opportunity! And what a profound demonstration of the wisdom of Judaism. Why, this rabbi lived hundreds of years ago, which was way before anyone had even dreamed of paying a trip to the moon. It must be that this rabbi knew secrets, from on high, and that one shouldn't reject Judaism as backwards. These rabbis surely know just as much secular knowledge as present-day scientists. It is a good thing Avner didn't bother looking in the sefer himself, or he would have discovered that Rav Yonatan Eibeshutz had written explicitly that people in his own time were discussing how to get to the moon, and that engineers had run experiments, upon which this rabbi was relying. Yoav was also impressed with how the sefer "was describing the tower in a way which sounded as close to the description of a rocket ship as anything he had ever heard". I suppose that he had not heard many descriptions of rocket ships, such that he could confuse a space elevator with a rocket ship. Either that or he did not get an accurate account of what the sefer described. As I wrote above, Rav Yonasan Eibeshitz's theory is indeed impressive, but not necessarily for the reasons typically given. Entertaining! I always find it tough when reading the Hebrew of such sefarim that use their contemporary science in what they say, you have to try and understand theories that don't make sense ("thick, murky air"). No such problem with chassidic works, it's just "chassidishe Torah"! The fact that migdal Bovel itself had flying capabilities is mentioned in earlier sources, which Reb Yoynoson Eibeshitz obviously saw. It doesn't necessarily mean that the whole tower was a rocket ship. It could combine a launching pad with actual ship. Reb Yoynoson just places that launch pad all way to the top. Reb Noson Breslover mentions, that words of chachomim do contain ruach hakoydesh in a sense, that they don't necessarily realize all potential meanings of what they said/wrote when they did that. This allows a wider interpretation of the meaning. Therefore I don't think there is one fixed way to read Reb Yoynoson's words. bli neder, i have intentions of reviewing that rashi in chagiga. i am not convinced that that is what rashi really means. Yes, very to the point :) The only conceptual difference would be, that magical technology allows bending natural way of physical universe, while non-magical one uses those ways in some combined manner, but for the observer - they can pretty much look alike. Another source about the fact that tower could fly is Rabbi Menachem Tziyuni. yes, i've seen this. bli neder, when i post on Rashi's Rocket Ship, i'll elaborate. each deserves it's own post, to say the least. Reb Menachem Tziyuni brings Meiras Eynaim (Rabbi Yitzchok demin Acco) who speaks about height of the tower matching some calculation of shiur koymo. But he adds the detail about flying tower which was seen in the sky. Actually someone pointed to me (see here and here) there are two different ways of reading sizes mentioned in Meiras Einaim, and according to them it fits into either leaving solar system, or leaving the galaxy. There is an underlying logic behind these, which fits the general intention of doyr haflogo. They wanted to overcome the influence of "mazoloys". In a simplest fashion it means planets, i.e. leaving the solar system will remove one from astrological (and physical) influence of solar planets. In a broader sense, if one leaves our galaxy - one is removed from the influence of visible stars. sorry I am 3 years late, but I only found this blog now. This idea of Eybesschutz is taken form sir Yitzhak Newton, the English scientist. He did a thought experiment on how to escqpe teh gravitation of the Earth, ie firing a cannon from the tallest tower or mountain. Newton was the Einstein of his day, so the idea must have filtered to Eybeschutz, who used it as his chiddush.